Survival conviction is running through the Rotherham United camp under new boss Kenny Jackett, striker Danny Ward has revealed. 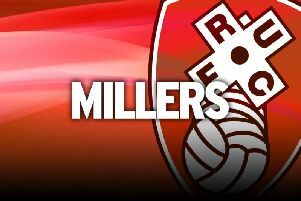 The Millers have 30 matches to save their season with their recently-appointed manager at the helm and Ward and his teammates are determined to still be a Championship side next year. Rotherham are bottom of the table and eight points away from safety after 16 league fixture, but have been boosted by the arrival of Jackett who replaced sacked Alan Stubbs three matches ago. Jackett’s men slipped to a 3-1 home defeat against Preston North End in their final encounter before the international break. But an encouraging 2-2 draw at Ipswich Town, which ended a run of seven successive losses, a week earlier offers hope of future success, says Ward who scored twice at Portman Road to take his tally for the season to eight. “If we play like we did at Ipswich, we will start winning games,” the 24-year-old maintained. Ward says Jackett has had an immediate impact on the squad who will be looking for only their second win of the season when they return to action, at Derby County, next Saturday. Jackett has presided over an unlucky 1-1 defeat against Reading, the draw in East Anglia where Ipswich equalised with virtually the last kick of the game, and the disappointing loss at the hands of Preston. “He has given the players a lift, but ultimately it is all about the three points,” Ward added. “The mood in the camp is good. Breaking the run of defeats at Ipswich was important and it was a good starting block. “We have always believed we can stay up and get out of it, otherwise there would be no point coming in every day. We’d just ‘sack it’ if we believed that.